The legal system plays a greater role in contemporary society as patients and their families have a greater understanding of their legal rights. As a result, healthcare professionals must have an understanding of how laws not only protect an individual’s rights, but are also established for the common good of society (in this case, to ensure the safety and protection of the country and its citizens). Federalism– a government composed of one central government and smaller governments by regionIn terms of the United States, there is one central government for the country and state governments for each of the individual 50 states. Checks and balances– were designed by the developers of the Constitution to ensure that one branch of the government would not have more power than the other. Each branch of the government will analyze and monitor each other’s actions to ensure that the branch does not overstep its powers. The Legislative Branch– known as Congress, is composed of the Senate and the House of Representatives. This branch handles the lawmaking process. The Judicial Branch– composed of judges and the federal courts, including the Supreme Court. Statutory law (also known as legislative law) focuses on statutes, laws enacted by state and federal legislatures. Federal laws have precedence over state laws and state laws have precedence over city laws. This means that a state or city can make laws that are stricter than the federal government’s laws, but it cannot makes laws that are less stringent.An example would be the federal law will state the requirements and scope of a professional’s practice. The state can have stricter requirements to become licensed or establish what services a professional can perform, but the state cannot have laws that are more lax than the federal government’s. Legislators pass statutes called enabling legislation which create agencies and authorize them to pass laws on certain issues focusing on areas which they are responsible for. Agencies are bodies established by either the federal or state government. Regulatory law focuses on regulations, rules or laws created by agencies. An example of a federal agency would be the Food and Drug Administration (FDA). The FDA regulates the sale and safety of food, prescription medications, vaccines and products such as cosmetics and food for animals (to name a few). The FDA passes and enforces laws to supervise the processes and ensure the safety of the public regarding these products. We will go into more detail when we cover administrative law in the next handout. Administrative law examines the regulations set forth by government agencies. Common law (also known as case law) is based on decisions made by judges from previous court rulings. The judges use decisions from past cases and apply them to current cases. We will cover the laws most pertinent to medical law and the healthcare professions. In this handout we will focus on civil (private) law since there are many points to cover. In the next handout we will finish up with criminal law, administrative law, and the American court system. Civil (private) law handles matters between individuals or between individuals and the government (which are not criminal). Civil law handles cases such as child custody, divorce, class action lawsuits, and negligence. Cases under civil law usually provide monetary compensation for injury or loss. Civil law includes tort law, contract law, property law, inheritance law, family law, and corporate law. We will focus on tort law and contract law since they relate to the medical and health professions. Tort law handles civil (private) wrongful acts that cause harm to an individual or an individual’s property. For cases under civil law, there has to be a preponderance of evidence, or evidence that provides weight which convinces the court to make a determination in favor of a party. In this case, the party who shows that more likely than not their facts have stronger accuracy and truth of the events and damages involved will win the case. For example, if the defendant has more convincing evidence that they were harmed as a result of an improperly performed procedure by a surgeon or developed an infection due to unsanitary conditions in the hospital they stayed at, the court will most likely rule in the defendant’s favor. Contract law covers enforceable promises and agreements between two or more individuals to perform (or not perform) a specific action. For example, if a physician and patient make an agreement for an outpatient procedure such as arthroscopy (a surgical procedure for the diagnosis and treatment of joint problems) detailing what’s involved including payment fees, and the patient ends up not paying after it is performed. The patient breached the contract by not complying with their agreed terms before the procedure. We will now cover tort law and contract law in greater depth. As stated earlier, tort law handles matters regarding acts that cause harm to an individual or an individual’s property. A tort is a civil injury (wrongful act) committed against an individual or property resulting in harm or loss. To bring a tort case to court, a patient must have suffered from a physical or mental injury due to the actions of a physician, hospital, or other healthcare provider. In order for the plaintiff (in this case, the patient) to receive compensation for damages, the defendant (in this case, the physician, hospital, or healthcare provider) must show to be at fault as demonstrated by the evidence. Torts are classified as either intentional or unintentional. Intentional torts occur when an individual has been intentionally or deliberately injured by another individual. The patient does not have to be touched for the tort of assault. If the patient has an “imminent apprehension” of bodily harm where they believe an action such as a verbal threat will result in physical harm to their well-being, it can be considered assault. For example, if a patient refuses to take their medication and the healthcare professional such as a nurse tells the patient that if he/she does not take their medication, the nurse will restrain them and put the medication into his/her mouth. This can be charged as assault since the nurse has the ability to perform the action. Verbal threats alone are not considered assault. If an individual is being threatened, but no action accompanies it (e.g. a patient is being active and difficult. The doctor says, “I’m going to sedate you.” However, the doctor does not have a syringe or sedatives present to carry out the action) then it is not considered assault. If it is indicated that the doctor can carry out the action after the verbal threat (“I’m going to sedate you”) by waving an unopened syringe in the patients face, it is considered a tort of assault. Battery– the tort of bodily harm and unlawful touching (touching without a patient’s consent)If a patient agrees to a procedure and signs a consent form, the physician can only perform services stated on the form. If the physician performs an action that is not an emergency life-saving procedure (such as CPR) and is not included on the form, it is considered battery. For example, if the surgeon is scheduled to remove a small bowel obstruction, but notices during surgery that there is a benign tumor, he/she has to wait until the surgery is complete. When the patient awakens from the surgery and is competent, the physician can discuss the tumor with the patient and check to see how they want to proceed. Hitting a patient or forcing a patient to do anything against their wishes such as dragging them out of bed to be bathed are included in the tort of battery. Assault and battery usually occur together. False Imprisonment– a violation of the personal liberty of another person through unlawful restraint; individuals are held/confined against their wishes and have no reasonable means to escapeExamples of false imprisonment include keeping a patient inside a hospital or clinic until their bills are paid (although it is uncommon nowadays) or locking a competent nursing home individual in a room to keep an eye on them. If a patient wants to leave the hospital against medical advice (AMA), the patient has to sign a statement that they are agreeing to leave against the advice of the physician. Defamation of Character– making false and/or malicious statements about another person (verbal or written) which result in damages to their reputation; includes slander and libelSlander, or oral defamation, is verbally making false and/or malicious statements which result in an injury to a person’s reputation. Libel, or written defamation, is printing or publishing writing, pictures, or signs which damage an individual’s reputation. The law protects physicians, nurses, social workers, and other professionals who report cases of abuse or document cases with sexually transmitted infections. Fraud– deceitful practices depriving another person of his or her rightsFraud can include promising that a drug or form of treatment can cure a disease when it really doesn’t. Another common type of medical fraud is billing for services that were not performed. This is a major issue for Medicare and Medicaid. This is also a problem when a physician bills for services performed by an individual who is not qualified. For example, having a technician start the infusion of a patient’s IV. Receiving illegal kickbacks (monetary compensation for referrals) also falls under fraud. An example is a company compensating a physician with payment to use their products on his/her patients. Embezzlement, a form of fraud, is the illegal appropriation of property such as money by an individual entrusted with its possession. An example would be an office manager or administrator willfully stealing funds from a physician’s office. Invasion of Privacy– unauthorized publicity of information about a patientA major example is leaking out HIV status without the patient’s permission or publishing photographs from surgery despite the patient or their loved one’s protests. Invasion of privacy can occur even after permission has been granted. If a patient retracts the permission and decides that they don’t agree to it anymore, healthcare professionals will be charged with an invasion of privacy if they continue to act (such as continuing to photograph the patient) upon it. The Supreme Court case Roe v. Wade (Roe v. Wade, 410 U.S. 113, 1973) argued for a woman’s right to privacy regarding matters related to and affecting her body, including pregnancy. Unintentional torts such as negligence, occur when the patient is injured as a result of the healthcare professional not exercising the ordinary standard of care. The standard of care refers to a professional exercising the type of care that any “reasonable” person would use in similar circumstances. The healthcare professional did not intend to harm or bring injury to the patient. Many lawsuits are related to the unintentional tort of negligence. Negligence is the failure or omission to perform professional duties to an accepted standard of care. When a professional carelessly performs an action or procedure or fails to perform an action that had to be done, then negligence is involved. Gross negligence is defined as serious carelessness. We had seen that actions have to exercise the ordinary standard of care, care that a reasonable person would use. Gross negligence are standards that fall far below what a reasonable person would use. The actions are usually considered reckless. Malpractice is misconduct or demonstration of an unreasonable lack of skill related to an individual’s professional skill (law, medicine, nursing, physical therapy, etc.). Anyone can be sued for negligence, but only professionals can be sued for malpractice. A person can only be sued for malpractice if they are negligent on services performed within their professional capacity. In medical malpractice cases, negligence is considered the predominant theory for liability. Contract law is the division of law that includes enforceable promises and agreements between two or more persons to do or not to do a particular action. Contracts or agreements include insurance, business, healthcare services, and real estate (to name a few). Contract law addresses breaches to these contracts. A breach is a neglect of an understanding between two parties or failing to perform the agreed terms of a contract. In a contract, the two parties enter a voluntary agreement that will benefit each other. A consideration is part of the agreement. In contract law, the consideration is something of value given as part of the agreement. An example of a consideration would be the attachment of a prosthesis (artificial limb) for a fee. The physician and patient will then form a contract where the physician will agree to attach the artificial device and the patient will allow the physician to perform the attachment. Both parties must be competent, capable of making a decision on their own volition, for a contract to be valid and legal. Contracts are classified as expressed or implied. An expressed contract is an agreement that is entered into orally or in writing and clearly states the terms in the agreement. An example would be signing a document stating that a third party agrees to pay for a part of a procedure under certain conditions or a patient consenting to have surgery performed. An implied contract is an agreement that is made through inference by signs, inaction, or silence. An example would be an individual presenting their arm to a physician or nurse to have their blood drawn or lifting the sleeves on their shirt to have a vaccine administered. A breach of contract is the failure, without legal excuse, to perform any promise or to carry out any of the terms of an agreement. If a physician fails to perform his/her contractual duty such as treating a patient’s appendicitis, the physician has breached the contract. If a patient fails to pay for the service that they agreed to, he/she has breached the contract. Either party may prematurely end the contract if the situation changes, but both parties must inform each other of their intent. Otherwise, the party would breach the contract. When terminating a contract with a patient, the physician must document and communicate with the patient or else they may be charged with abandonment. For example, if a patient fails to keep their appointments or wants to switch to another provider, the contract may be prematurely ended. The documentation related to the termination of a patient’s services should be kept in the patient’s medical record. Class action lawsuits are lawsuits filed by one or more people on behalf of a larger group of people who are all affected by the same situation. This is most commonly seen when a large number of people experience adverse effects to drugs or medical devices and they sue the pharmaceutical or medical product company. In the next handout we will cover public law (criminal and administrative law) and the American court system. Continuing our discussion on absolute value we will cover an important concept in mathematics called The Triangle Inequality. The Triangle Inequality states that the length of the two sides | a | + | b | is greater than or equal to the length of the third side | a + b |. 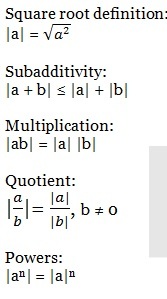 (The absolute value of the sum of | a + b| is always less than or equal to the absolute value of each individual sum | a | + | b |). However, note that | a + b | ≠ | a | + | b | since having opposite signs for real numbers a and b will result in different values for each side. The left side will result in subtraction while the numbers on the right side are added. Both sides will equal 3. Again, both sides will equal 3.
is true because if we substitute a real number for “a”, the statement is true. If k = ± 1, and we put the values into | a |, then | -1 | and the | 1 | both equal 1 (k). Now let’s apply the Triangle Inequality in an example. Example 1: If | x – 5 | < 0.3 and | y – 7 | < 0.6, estimate | (x + y) – 12 | using the Triangle Inequality. Hi everyone, I know that the formatting might be weird and I apologize. It’s easy to perform scientific and technical writing on my word processor, but it gets a little complicated here. I use equation formulas and formatting that don’t translate well into WordPress. I know that there are plugins for it, but I think that putting the parts that require the equation format as pictures is also clear. The blog entry is also a way to skim the information so that if you’re interested, you can download the pdf version on my math and science site. Thanks so much for your patience and support, I appreciate it. In the cases above, the numbers are not included in the interval. 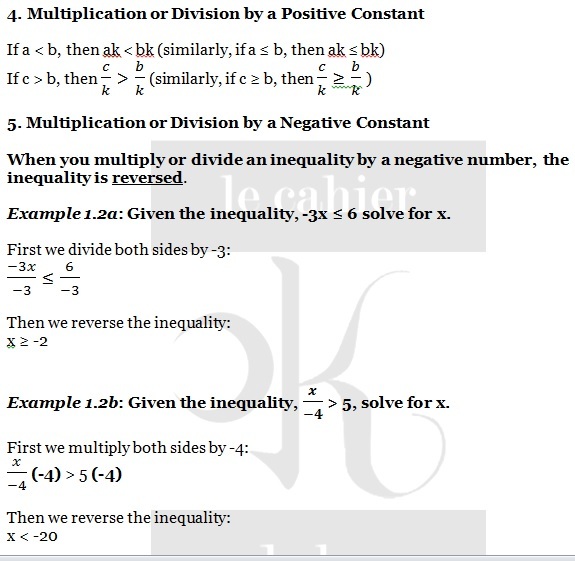 For real numbers a, b, c, and constant k.
*For the graphs, see the accompanying inequality graph worksheet. In open intervals, the endpoints a and b are not included. They are denoted by parentheses (a, b) and when graphed on a number line, the circles are open/hollow. In closed intervals, the endpoints a and b are included. They are denoted by square brackets [a, b] and when graphed on a number line, the circles are closed/solid. *Graphs to the solutions for the examples are in the inequality graph worksheet. Solve the linear inequality 4x +3 > 15 and graph its solution on the real number line. Solve the linear inequality -4 ≤ 2x + 6 ≤ 14 and graph its solution on the real number line. Solve the quadratic inequality x2 + 6x + 14 ≤ 6 and graph its solution on the real number line. 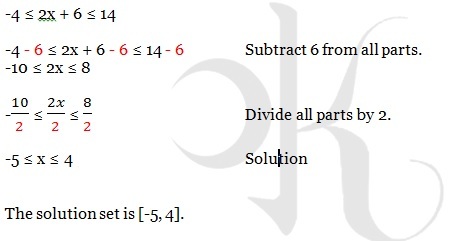 x2 + 6x + 14 – 6 ≤ 6 – 6 Subtract 6 from both sides to change to general form. When we solve for x, we get x = -4 and x = -2. We have to test the signs in each test interval to solve the inequality. Step 1: Choose a number in the interval and compute by replacing the x in the polynomial. So for the interval (-∞, -4], we choose -5 and put it in the polynomial to test the sign. The polynomial is positive for all real numbers in the interval (-∞, -4]. For the interval [-4, -2], we choose -3. The polynomial is negative for all real numbers in the interval [-4, -2]. For the interval [-2, ∞), we choose 0. The polynomial is positive for all real numbers in the interval [-2, ∞). Step 2: Now we look at the original inequality. In this case, the solution is [-4,-2] since the polynomial is negative for all real numbers in this interval. The absolute value of a number can’t be negative. Example 1.2f: Find the absolute value of -8. If real number a = -8, then -8 ≤ 0. So, we use -a. The solution set is the single interval (-15, 5). The solution set is the union of the disjointed intervals (-∞, -14] and [2, ∞). Example 1.2i: Find the distance between -6 and 3. In both directions, -6 and 3 are 9 units from each other. From a to b (going left to right), the directed distance would be 9. This is the directed distance from a to b. To compute, we use b – a. In this example, 3 – (-6) which would be 3 + 6 to get 9. From b to a (going right to left), the directed distance would be -9. This is the directed distance from b to a. To compute, we use a – b. In this example, -6 – 3 to get -9. The midpoint is the average value of endpoints a and b.